Boat fishing for Bass in the Solent! A boat trip on Sunday saw us sailing out of Langstone Harbour in Hampshire with 8 other keen anglers in search of bass. 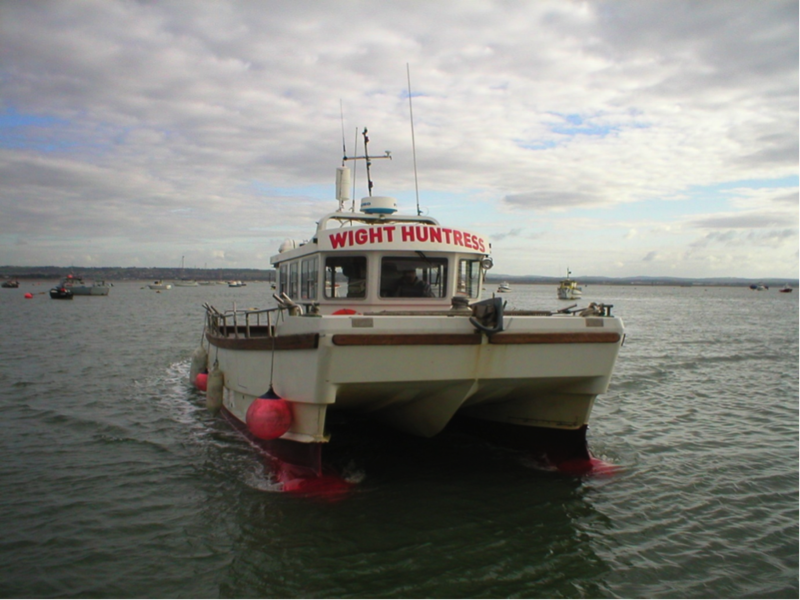 We sailed on Wight Huntress II, operated by skipper Glen Milligan. His deck-hand Reg was also along for the day to provide tea, coffee, some laughs and to help with landing fish. The plan for the day was to visit the offshore banks and drift for bass, using lures and live baits. My husband Rich and I went equipped with a selection of soft plastic lures and our own boat fishing outfits, Rich preferring a 12-20lb class boat rod with multiplier and myself with a 9ft spin rod and small reel. Both were loaded with braid and a mono leader. The set up was simple, a small weight attached to the leader via a swivel clip and a 5ft trace of 15lb fluorocarbon line for the lure. No beads or booms so as not to spook the bass. After about an hour’s steaming, we arrived at the first mark. The anticipation from all the anglers was high as it came time to try the very first drift. The weather was calm and warm but overcast. Even offshore the sea was virtually flat-calm. A good tide was running as we all lowered our chosen lures over the side. 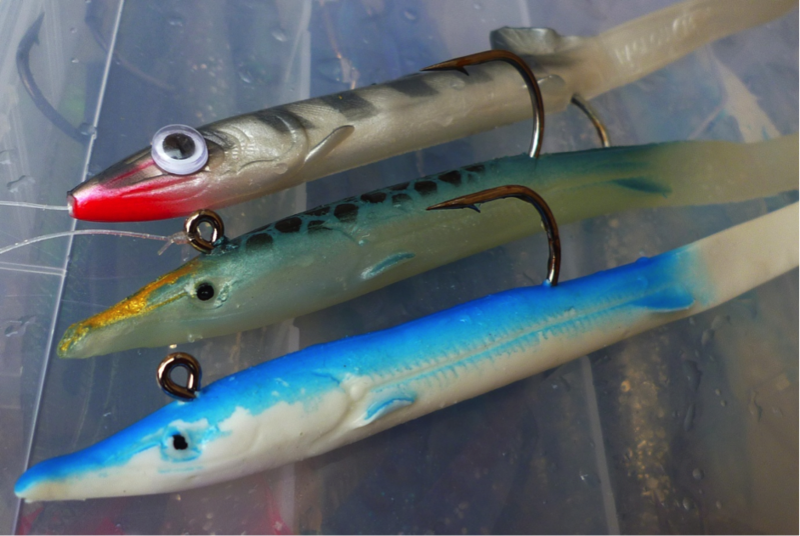 Upon Glen’s advice, most of us had gone for the Red Gill Evolution lures in Blue and White. Nothing on the first drift, but it was still early and we had a full 6 hours of fishing ahead of us. On the second drift Rich theorised that, if there were masses of blue and white lures in the water, that he would try a different lure to ‘stand out from the crowd’ and try to attract a bass. So he picked out a lure he had bought that weekend, the Ragot Raglou Tiger, but which we referred to all day as the ‘goggly-eyed’ lure as it did have rather comedy stick-on eyes! Still, laugh at this inexpensive lure I might, but it resulted in a bass on that next drift. At the same time, another bass hit my Red Gill lure and we both had two fantastic fish of about 3.5lbs each. It seemed as if the entire boat had sprung into life, with a mad frenzy of activity resulting in some stunning fish for the majority of the anglers. On the next few drifts in the morning the bass continued to be caught, with two 10-pound fish and a 9-pounder being caught. Additionally, it was lovely to see these double-figure fish being photographed and then released unharmed to help preserve the breeding stocks. At slack water we moved to a different mark to drop dead baits for bigger fish, or feathers and sabikis to try to catch some mackerel. Unfortunately the mackerel weren’t there, so there was no opportunity to try fishing with live baits. 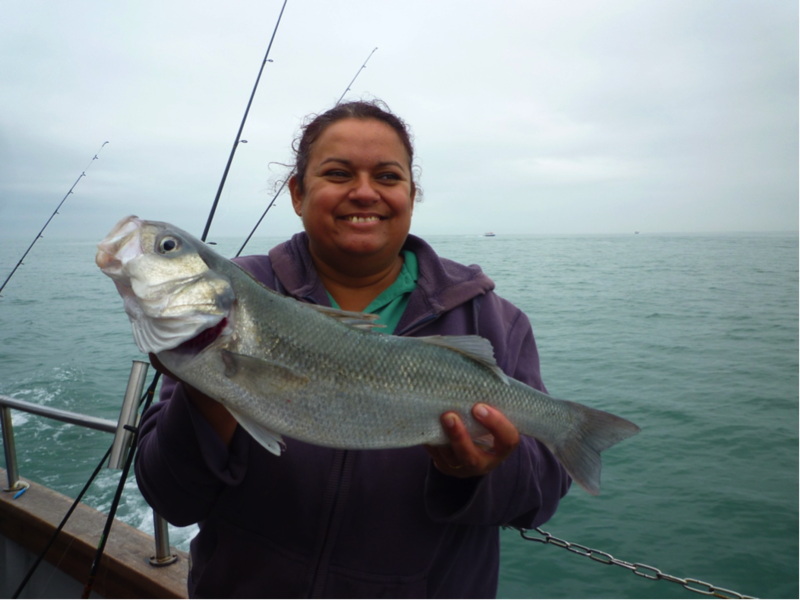 However, there were a few good sized dogfish caught, as well as a large channel whiting, scad and one or two larger fish that got away by biting right through the traces. In total I landed 3 bass and a dogfish to Rich’s solitary bass, putting me back in the lead with our fishing competition by just one fish! Our total scores for the year were now 118 to me and 117 to Rich. 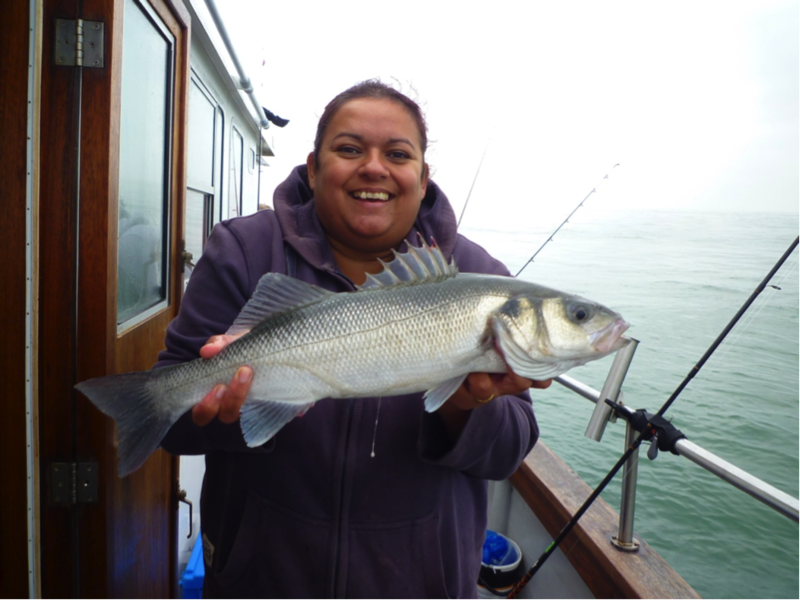 It soon became time to head back in, Glen turned Wight Huntress back towards shore whilst we congratulated ourselves and our fellow anglers on a great days fishing with some stunning bass caught. Glen certainly knows his stuff when it comes to boat fishing and will work hard to put you on the fish. He has fished the local waters for over 20 years and has also fished and won many competitions including the European Individual Championships, and silver and gold World Championship medals as a member of Team England. He welcomes anglers of all abilities aboard his boat and is more than happy to offer advice and tuition throughout the day. He can also hire boat rods and tackle for those that do not have their own.